podcastS5:E8 - "Shrinking and growing heaps with cats"
podcastS5:E7 - "A heap of heaps"
podcastS5:E6 - "The big O of quicksort"
podcastS5:E5 - "Quick sort Queendom"
podcastS5:E4 - "Merge sort stops the suckage"
podcastS5:E3 - "Sorting with insertion sort"
podcastS5:E2 - "What's bubble sort?" podcastS5:E1 - "The simple selection sort"
podcastS4:E8 - "The Saron Sort"
podcastS4:E7 - "Sorting the Michaels"
podcastS4:E6 - "It's sorting time!" 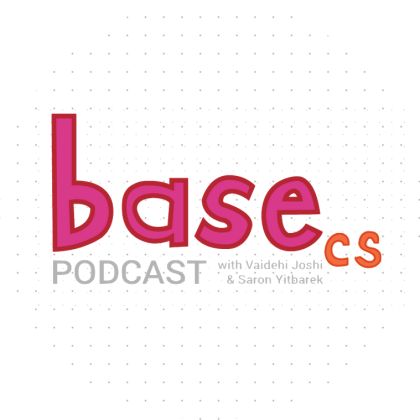 podcastS4:E5 - "Sets, sets, everywhere"
podcastS4:E4 - "Varon explains set theory"
podcastS4:E3 - "Chaining to the rescue!" podcastS4:E2 - "Too many Brians at the (hash)table"
podcastS4:E1 - "Gotta hash 'em all"
podcastS3:E8 - "BFS is your BFF"
podcastS3:E7 - "Getting in line for breadth-first search"
podcastS3:E6 - "Drowning in DFS"
podcastS3:E5 - "When the washing machine's 'Inorder'"
podcastS3:E4 - "Preorder-ing at the family BBQ"
podcastS3:E3 - "Making brownies with depth-first search"
podcastS3:E2 - "Seven bridges and a triangle"
podcastS3:E1 - "Oily graphs in Königsberg"
podcastS2:E8 - "Let's get graphic"
podcastS2:E7 - "Logarithm is gonna get you"
podcastS2:E5 - "What's a binary tree?" podcastS2:E3 - "Don't be stumped ... by trees"